The summertime is meant for fun in the sun while splashing and swimming around in the cool water, and for many parents, buying a kiddie pool (or a “kiddy pool”) for their little ones can make all the difference. To beat the heat, a kiddie pool can be an endless source of relief and entertainment for kids while older teens are away in bigger in-ground pools. To make sure you’re buying a kiddie pool that’s worth the money and is good quality, you can use this guide to help you choose the right pool for you and your kids. 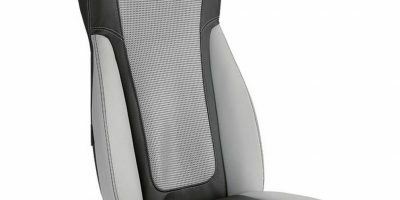 Scroll down for the buying guide! Because babies are too delicate to play with the bigger kids, baby pools allow them to have their own fun in a pool that’s the perfect size for them and their summertime buddies. The water is more shallow than larger kiddie pools and isn’t too overwhelming for a small child. This is a simple yet colorful inflatable baby pool that can hold up to 22 gallons of water. The floor of the pool is also inflatable and soft enough for your child to sit and play in it comfortably. On the outer edge, there are three rings that stack up for extra safety and comfort. Made with 8-gauge vinyl, this pool measures 34 inches from outside edge to outside edge, but can still fit two small children. Some users mentioned they’ve used it as a ball pit or a play pen because of the important inflated base. The only hassle to this pool is each color tier has to be inflated, but other than that, this pool is a great option for those on a tight budget. In this cute smiling giraffe baby pool, there are two colorful inflatable rings and two hanging noise makers for your little one to play with. It can hold up to 14 gallons of water and has a wall height of four inches, making it a practical and safe pool for splashing around and staying cool. It’s easily inflatable by mouth or by hand pump, along with being durable enough to stay inflated throughout playtime and the summer. Although, users have noticed that the giraffe head doesn’t seem to stay inflated, but it doesn’t affect the rest of the pool. Draining the water is almost effortless, making it easy to clean and stow away for the next time you need it. This kiddie pool is one of the best based on quality and price, offering lots of fun additions for your kids to enjoy. The play center has a water slide, wading pool, a ring toss game with 4 inflatable rings, and a water sprayer. The water sprayer can connect to a hose to keep the kids cool in the sun. The pool can hold up to 77 gallons and also comes with a ball roller and toss game. You can have around five toddlers play in this pool and you can also use it as a ball pit. Keep in mind that a pump doesn’t come included, so it may be difficult if you’re planning to hand pump the pool. Also, some have noted that draining and cleanup can be a pain, and the pool drains most but not all the water. If you’d like to see how one user has set up this pool, you can watch a video below on inflating it, filling it with water, and more detail on its features. This is a very colorful baby pool suitable for babies up to the age of three and can carry up to 12 gallons of water. The surrounding walls are five inches tall for safe play in the water, and it even has a built-in mushroom sunshade so your little one can stay protected from the hot sun. 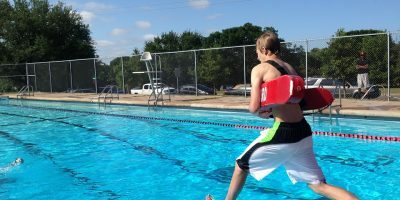 The floor of the pool is inflated to prevent injury from slipping, and the whole pool itself measures in at 40 inches in length and 35 inches wide. Once inflated, this pool is durable enough to stay that way for a long time and has enough room for two small babies. Inflating it can be a bit of a hassle, for there’s three separate sections, but once done, it stays strong and sturdy for when your kids are playing. Your baby can stay shaded and have fun in the water at the same time in this royal castle pool with a built-in sunshade. There are windows on the side for added visibility, air flow, and easy access. The pool can hold 18 gallons of water and has a wall height of five inches for comfortable sitting. From the outside edge to edge, the pool is 48 inches long, along with being 48 inches wide and high. There are about 4 sections of this pool to inflate, and once inflated, it’s sturdy enough for a baby to sit upright unassisted. It takes a while to blow it up manually and the bottom of the pool isn’t padded, so supervision is recommended. These kinds of pools are typically larger and deeper than those built for infants but smaller than a regular sized above ground pool. Some kiddie pools even have enough room for parents to join in on the fun. This pool is great fun for kids three years and older, measuring at 45 inches in length, 45 inches wide, and 10 inches high. You can fill it with 6 ½ inches (17 cm), or 62 gallons, of water while your kids sit and splash in the pool surrounded by three crystal blue inflatable tiers. For those that are looking for a fun summertime addition to their yard, this pool is one of the more affordable options so your family can enjoy the cool water without breaking the bank. While the Intex crystal blue pool is easy to blow up and durable, draining it can be a bit of a chore since it doesn’t have a drainage plug. Scooping out the water first before lifting the pool is recommended so the vinyl doesn’t stretch. Also, the bottom isn’t inflated, so supervision might be needed to make sure your little ones don’t slip. Ideal for kids ages three and older, there’s room for the whole family to enjoy splashing in the water in this pool. The edges have clear windows with fun and colorful design to act as an attractive addition to your yard. For cleanup, the convenient drain plug makes it easy to dump the water and stow away the pool. This is a fairly good sized pool, measuring in at 62.5 inches long, 62.5 inches wide, and 19.5 inches tall so you and your kids can wade around in the cool water. The sides of the pool are reported to hold up very well, but be sure to have an air pump or you’ll burn through half an hour instead of a quick five minutes. Also, some users noticed that the pool takes a long time to drain because of its size. Besides these issues, this is a simply yet great summer pool for the whole family to enjoy. This pool is fun for both kids and parents alike with it being able to carry 89 gallons of water, or 9 ½ inches of wall height. It’s suitable for children three years of age or older, and the pool is held up by foam padded horizontal beams for comfort. For cleanup, there’s a drain plug at the bottom and a repair patch kit comes included in case of any accidents. The pool measures out to be 48 inches long and wide, and 12 inches high. Users have said that the pool is relatively easy to set up, and many have even used it as a doggy pool. Although, mind that the bottom isn’t that thick and you have to prop something underneath the pool to keep it draining. Made from durable 13-gauge vinyl, this mandarin family pool can be enjoyed by the whole family and is made for kids age six and older. Its two-ring design makes the surrounding walls up to 18 inches high, so it can hold around 137 gallons of water, or up to 13 inches. It’s quite a big size so adults can lounge in it while the kids still have room to make waves and splash around. The pool itself is nice and sturdy, although some users have noticed that the walls of the pool don’t stay inflated for too long, and the drain plug does need to be propped up a bit since the ground can block the hole. What is a Kiddie Pool? Most kiddie pools are made out a vinyl or plastic material and are inflatable. Inflatable ones are recommended if you plan to have younger children playing around in the pool for safety reasons. Storage is a very important aspect of kiddie pools for many because most of us don’t like things to take up too much space to the point where it’s inconvenient. Because kiddie pools aren’t usually kept set up all throughout the year, it’s best to have an easily collapsible pool that can be stored almost anywhere. 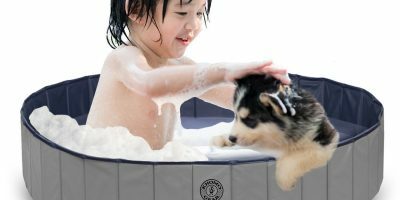 Hard plastic wading pools aren’t as collapsible as inflatable ones, since inflatable pools can fold up into a compact shape while hard plastic pools can have several pieces to stow away. 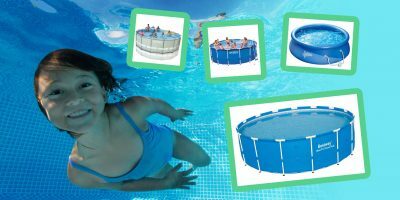 Depending on your preference, if you don’t want just a simple round or square kiddie pool, there are plenty of options that come with additional toys and built in features, with some that can further the safety of the pool. Slide – A slide lets kids slide down into the pool for exciting splashes. They are either built-in or separate and made of hard plastic or are inflatable. The Intex Rainbow Ring Inflatable Play Center (see below) pool has a slide that starts from a wading pool and leads to a slightly deeper and bigger section. Sprinkler – This is a feature that can be found on the Intex Play Center pool and is a part of the pool where a hose can be attached and acts as a refreshing shower to keep the kids cool. Sunshade – A sunshade, or canopy, can either be built-in or separately attached to the sides of the pool and provides protection from the sun, which is important for younger kids. The Intex Lazy Fish, Royal Castle, and Mushroom (see all below) baby pools have an attached sunshade incorporated into their clever designs. Inflated Base – This cushions the kids from the hard ground or bumpy grass and is usually incorporated into the pool itself. The Intex Sunset Glow, Lazy Fish, and Mushroom pools have a padded base to keep your baby protected from bumps and bruises. Toys – Toys can be included with certain kiddie pools and can be separate plastic or inflatable pieces, or they can hang from a section of the pool to allow babies to entertain themselves while they’re splashing in the water. There are several toys to play with in the Intex Smiley Giraffe, Mushroom, and Rainbow Ring Play Center pool, such as hanging noise makers, inflatable rings, and inflatable toys. Play Center – A play center is made up of several different areas for kids to play in, such as a wading pool that flows into a bigger pool. There are also a variety of entertainment options like ring toss attachments or balls. 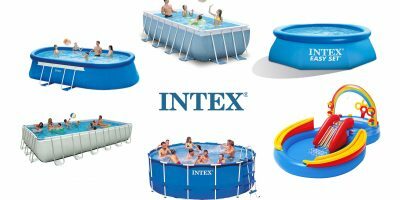 These extra features can either be built into the pool or can be attached manually, and the Intex Rainbow Ring Play Center is a great example of all of these items included in one pool. There are many options nowadays for different colored kiddie pools with many varieties of shapes, patterns, and images. If you’d like to add some creative stimulus to your kid’s playtime, you can find pools that have multi-colored rings, are built in a clever shape like a castle or a fish, or have images of sea life and the beach. It’s common sense to know that the more water a kiddie pool holds, the pricier it’ll be to fill it up, making it harder to drain and clean it. Hard plastic pools are generally easy to drain and refill, but owners of larger kiddie pools tend to want to leave it inflated and filled to save money. The problem with keeping a larger kiddie pool filled is that hygiene becomes more of a concern, considering that after a while, dirt, dust, bugs, algae, and other things can contaminate the water, forcing you to either dump out the whole thing or use chemicals like chlorine and algaecide. As mentioned before, kiddie pools don’t have a filtration system, so if you are going to use such chemicals to keep your kiddie pool clean, be sure to read directions carefully so that you use these chemicals safely. You can look at some tips here for more detail on how to safely use cleaning solution in your pool. In terms of inflating, larger pools can make it harder to tell when air is leaking. Be sure to have repair patches on hand and check the state of the pool often to ensure your child’s safety for the next time they play in the pool. Be careful not to overinflate your kiddie pool since this can cause the material to stretch, making the material weak and more prone to air leaks. Also, dragging the pool across the ground can crack hard plastic pools or cause punctures in inflatable pools, ultimately leading to water and air leaks. When you’re ready to store your pool away, make sure to keep it in a safe and covered environment such as a shed, garage, or plastic bin to protect it from the outside elements. Never leave your children unattended in a kiddie pool while filling the pool and while the kids are in the water. Although kiddie pools are generally shallow, drowning can still be a possibility. Kids shouldn’t jump into a kiddie pool, especially those without an inflatable base, for they can slip and injure themselves. For more ways to keep your kids safe while still having fun, here are some more tips and advice on preventing injury and accidents. You and your kids can have an enjoyable time in the summer sun with a kiddie pool you can trust, and without spending too much cash. It’s definitely possible to find a pool that works for you and most importantly, your little ones so they can have fun summertime memories in the water.